In her introduction to One Hundred Shadows, Man Booker International Prize winner Han Kang sums up the surreal yet recognizable atmosphere of the novel when she calls it a well-controlled mix of fantasy and realism. Indeed, the novel draws the reader in slowly but firmly, only introducing such things as “rising shadows” and surreal landscapes here and there. The cumulative effect, though, is a quiet lyricism that functions as an ode to a crumbling world. Set in a slum electronics market in central Seoul, One Hundred Shadows is told from the point of view of Eungyo, a young woman who works as an assistant in one of the repair shops. She and her friend, Mujae (who also works at this market), explore the nooks and crannies of this little island of desolation together, eating simple meals, discussing everything from the meaning of the word “slum” to their futures once the demolition of the electronics market is finally complete. On the whole, the book exudes a quiet sadness mixed with a glimmer of optimism- the latter, I think, stems from the sweet and tentative relationship that develops between the two friends. I found myself rooting for Eungyo and Mujae to become a couple and then face their crumbling, bleak world together. 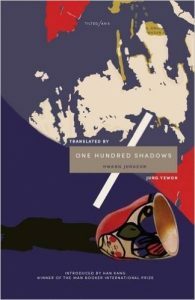 But One Hundred Shadows is so much more that the sum of its plot points. Hwang Jungeun builds up this world layer by layer, asking us to reconsider words that we take for granted, street scenes that we might look at but never really see, people’s shadows (and why they might detach themselves from their owners), and much more. Through Eungyo and Mujae’s discussion “dates,” we’re invited to think about human frailty through the figure of a matryoshka doll, or the broken-down electronics that are repaired with spare parts that are themselves ancient. You could call this a work of “fantasy,” but the line between the fantastic and the real is so blurred in this novel that it becomes unimportant. In fact, it’s precisely this melding of the bleakly ordinary and the unexpectedly weird that makes One Hundred Shadows so gripping and quietly intense. It’s the kind of book that you’ll finish and then spend half an hour staring in to space just processing what it was you just read. This is one of my favorites of 2016.